ATLANTA, GA and BOTHELL, WA, May 11, 2018 (GLOBE NEWSWIRE) -- Cocrystal Pharma, Inc. (NASDAQ: COCP), (“Cocrystal” or the “Company”), a clinical stage biotechnology company discovering and developing novel antiviral therapeutics that target the replication machinery of hepatitis viruses, influenza viruses and noroviruses, announced today its financial results for the quarter ended March 31, 2018 and provided a corporate update. Presented an overview of the Company’s unique structure-based drug discovery technology and Nobel Prize winning expertise to create what the Company believes to be first- and best-in-class antiviral drugs at the Fred Hutch and Merck Infectious Disease Summit. CC-31244, the Company’s lead product in development for HepC, is an investigational, oral, potent, broad-spectrum replication inhibitor called an NNI. It has a high barrier to drug resistance designed and developed using the Company's proprietary structure-based drug discovery technology. It is a highly potent, selective pan-genotypic non-nucleoside inhibitor that is active against all genotypes (1-6) with low level cytotoxicity in multiple cell types. The Company recently announced that its Investigational New Drug (IND) application submitted to the FDA is now open and the Company is cleared to initiate its Phase 2a clinical study evaluating CC-31244 for the treatment of HepC-infected individuals. The Company previously announced positive data from the Phase 1a/1b trial of CC-31244 for the treatment of chronic HepC infection. This randomized, placebo-controlled, double-blind Phase 1a/1b study evaluated single and multiple ascending doses of CC-31244 for safety/tolerability, pharmacokinetics, and antiviral activity in HepC-infected patients. In Phase 1a, 30 healthy volunteers received single doses (20-400 mg) of CC-31244, and 12 healthy volunteers received repeated doses of CC-31244 (either 200 or 400 mg) for 7 days. In Phase 1b, 15 patients with HepC genotype-1 infection received CC-31244 for 7 days (6, 400 mg daily; 6, 600 mg daily; 3, 200 mg twice daily). As reported, there were no dose-limiting adverse events, study discontinuations due to adverse events, or serious adverse events. Viral load data showed that CC-31244 administered once daily (400 mg or 600 mg) or twice daily (200 mg) for 7 days had a substantial and durable antiviral effect, with an average HepC RNA viral load decline from baseline of 1000-fold by Day 4. Interestingly, the mean viral load at 6 days after the last dose persisted in the range of 100-fold below baseline. HepC genotype 1b cell-based replicon assays using combinations of CC-31244 with other classes of HepC drugs showed additive and synergistic effects of CC-31244, providing important information for ultra-short therapy cocktail regimens. Announce topline results from CC-31244 HCV Phase 2a study in Q4 2018. In addition to the Company’s HepC clinical program, Cocrystal is developing novel, broad spectrum influenza antivirals that are specifically designed to be effective against all strains of the influenza virus and to have a high barrier to resistance due to the way it targets the virus. Cocrystal’s uniquely developed lead molecules target the influenza polymerase, an essential replication enzyme with several highly conserved regions common to all influenza strains, enabling the inhibitors to be active against all strains of the influenza virus, including pandemic strains. CC-42344 is a highly potent PB2 inhibitor and shows a favorable pharmacokinetic and safety profile. This lead molecule is currently being evaluated in preclinical IND-enabling studies for the treatment of influenza and the Company expects to initiate a Phase 1 study in Q4 2018. Initiate Phase 1 study evaluating CC-42344 for the treatment of influenza in Q4 2018. For the quarter ended March 31, 2018, the Company reported a net loss of approximately $1,553,000 compared to a net loss of approximately $2,548,000 for the same period in 2017. The overall decrease of $995,000 is primarily due to staff changes that led to a $373,000 reduction in personnel expenses, settlement of outstanding legal matters resulting in a $139,000 reduction in legal expenses, and a $579,000 reduction in R&D program spend as Phase 1 testing concluded during 2017. Total research and development expenses were approximately $877,000 for the three months ended March 31, 2018, compared with $2,071,000 for the three months ended March 31, 2017. This decrease of $1,194,000, or 58%, was due to the conclusion of Phase 1 clinical trial during the 1st quarter of 2017 and lower pre-clinical testing. Pre-clinical work previously performed in house is now being outsourced. General and administrative expenses were $1,190,000 for the three months ended March 31, 2018, compared with $1,050,000 for the three months ended March 31, 2017. As of March 31, 2018, the Company had $1.2 million in cash and cash equivalents. 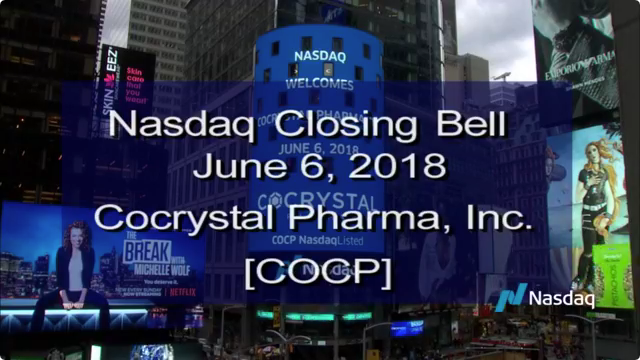 Subsequent to the quarter end, on May 3, 2018, Cocrystal announced the closing of an underwritten public offering. The gross proceeds to Cocrystal from this offering were approximately $8 million before deducting underwriting discounts and commissions and other offering expenses. Cocrystal has granted the underwriter a 45-day option to purchase up to an additional 631,578 shares of common stock to cover over-allotments, if any. Cocrystal Pharma, Inc. is a clinical stage biotechnology company discovering and developing novel antiviral therapeutics that target the replication machinery of hepatitis viruses, influenza viruses, and noroviruses. Cocrystal employs unique structure-based technologies and Nobel Prize winning expertise to create first- and best-in-class antiviral drugs. CC-31244 is a Phase 2a ready broad-spectrum novel non-nucleoside replication inhibitor of HepC. Phase 1b studies in HepC infected patients showed the largest reduction in viral load of any non-nucleoside inhibitor tested to date. The next step for CC-31244 is clinical trials as part of a cocktail for ultra-short therapy of 2 to 6 weeks. The lead candidate for influenza has advanced to IND-enabling studies. It is effective in animal models against both the pandemic and seasonal strains of influenza. In addition, the Company has a pipeline of promising early preclinical programs. Two private investors own approximately 48% of the Company. Corporate investors include OPKO Health, Inc., Brace Pharma Capital, LLC and Teva Pharmaceuticals Industries, Ltd. For further information about Cocrystal, please visit www.cocrystalpharma.com. This press release contains forward-looking statements within the meaning of the Private Securities Litigation Reform Act of 1995, including our expectations regarding the commencement and future progress of the Phase 2a study, our achievement of the clinical program milestones in 2018, the effect of such achievement, and our future success. The words "believe," "may," "estimate," "continue," "anticipate," "intend," "should," "plan," "could," "target," "potential," "is likely," "will," "expect" and similar expressions, as they relate to us, are intended to identify forward-looking statements. We have based these forward-looking statements largely on our current expectations and projections about future events. Some or all of the events anticipated by these forward-looking statements may not occur. Important factors that could cause actual results to differ from those in the forward-looking statements include the availability of products manufactured by third parties, the ability of the clinical research organization conducting the Phase 2a study to recruit subjects and obtaining regulatory clearance for our planned Phase 1 study. Further information on our risk factors is contained in our filings with the SEC, including the Prospectus Supplement dated April 30, 2018, and our Annual Report on Form 10-K for the year ended December 31, 2017. Any forward-looking statement made by us herein speaks only as of the date on which it is made. Factors or events that could cause our actual results to differ may emerge from time to time, and it is not possible for us to predict all of them. We undertake no obligation to publicly update any forward-looking statement, whether as a result of new information, future developments or otherwise, except as may be required by law.